Nissan Frontier Forum > Nissan Frontier Forums > Dealerships - The Good and The Bad > Are all dealers as screwball as the ones FL? I guess the moral to the story is if you find a "good" dealership that is a pleasure to work with then patronize them. I have been dealing with Lamb Nissan in Prescott, AZ since 2014 and they are wonderful. Sales, service the whole 9 yards. I am told that Coulter Nissan in Surprise, AZ is also very low pressure and good to deal with so it appears that not all are horrible. Good luck. I have been dealing with Lamb Nissan in Prescott, AZ since 2014 and they are wonderful. Sales, service the whole 9 yards. Thanks for the input ghmph; I spend over half the year near Prescott and have a 1998 Frontier with 236K (purchased at 100K miles) and a 2004 creampuff Frontier with 102K (purchased at 90K miles). I've never been to Lamb Nissan, and never have had a dealer do any service work period. Last fall the 2004 had its AC compressor seize on the way to California, fixed that myself; the 1998 still has original AC system except for a new high pressure line to replace the original which developed a pinhole. '98 2WD, 4-cylinder, 5-speed, white regular cab, purchased in 2004 with 100K on it for the kids to drive, now it's back with us, 237K. 2004 King Cab 2WD, 4-cylinder, 5-speed, electric blue purchased in Dec. 2011 at 89K. Also 1988 Mazda B2200 Cab Plus truck (since 1994, 217K), 2WD, 4-cylinder, 5-speed, great truck. And 1971 VW Convertible (mine since 1976) and 1970 VW (260+K, mine since 1972). I bought my 2017 SV from Jenkins Nissan in Lakeland FL about a month ago. Found it on Autotrader. Truck was a “certified” vehicle with 100k mile drive train warranty. Truck had 13k miles on it. Has the value added package, leather interior, running boards, tinted windows, trailer package, mud flaps, and bed extender. Deal was super easy. 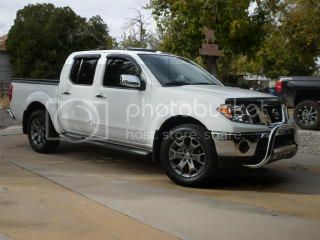 Sent photos of my 2012 Frontier Sport with 55k miles up them made the deal over the phone. Bought the truck for $19400 plus tax and tag. They gave me $13400 for my truck. Drove up there and was out in 30 minutes!! Had researched trade in and private party values on my 2012. Prices ranged from $10-12k. Getting $13400 was great! I would recommend them to anyone in the area. Treated me great. That's so very true. It's the root of why educated and informed shoppers like those of us on this thread get little respect at most Dealers. I think salespeople are used to a quick sale to the crowd of buyers who are bad at math and have credit approval. When people like us enter a Dealership, they fail to realize that a different selling technique is required and they have no idea how to respond. We've lived in our current home for 30 Years, yet have never bought locally. Because our local Dealers are so useless, we've bought all of our cars out of state. Buying with cash these days is no longer the incentive it used to be due to the sales people making big chunks on financing. I'd share your experience with Nissan directly. It really won't change anything, but it might make you feel better and then you can enjoy the truck. Jenkins is my closest dealer about 15 mins away, and was where they pulled the whole *come in the office for a price itÂ’ll earn me points with my boss* thing. I was not impressed, plus at the time they didnt have any 4x4 models. I have learned that about cash in my last couple of car purchases. they tried to pressure me to finance mine for a couple hundred dollars savings, it honestly wasnt worth the hassle for me so I passed. Maybe if it had been 1k+ off I would have considered it. We live in the same city. I don't have anything to contribute other than that. I just thought it was neat, lol.